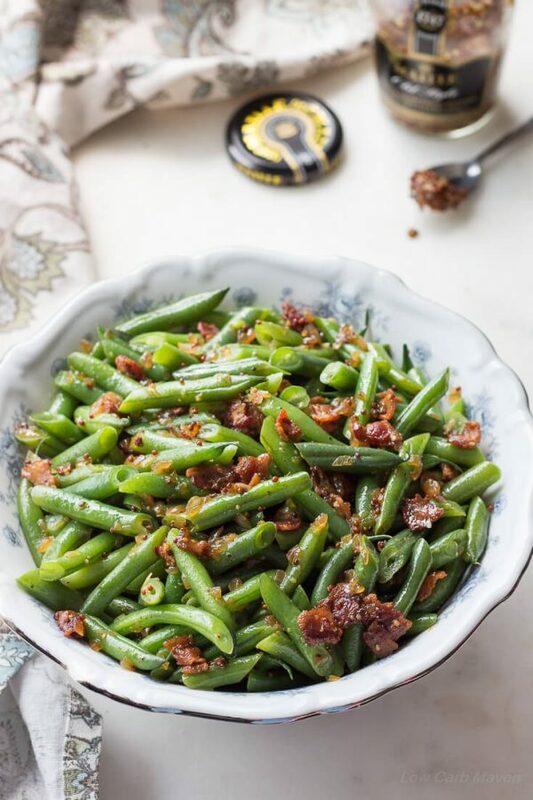 German green beans feature crisp-tender green beans warmed in a sweet and sour sauce with bacon, onions, cider vinegar and brown sugar. It makes a delicious healthy low carb side. My children started school a few weeks ago. If you’re a parent, then you know weeknight cooking changes to accommodate hectic schedules during the school year. I’m on the lookout for easy sides and meals I can put together in 30 minutes. Green beans are on our menu every week! They’re low in calories, low in carbs, and high in fiber, which makes them the perfect choice for my low carb diet. This recipe for German green beans is perfect for weeknight meals. In my spare time, I like to look through my collection of cookbooks, but I rarely cook from them. Instead, they serve as a source of inspiration. While flipping through a vintage cookbook my mother gave me, I stumbled over a recipe for German Green Beans. It’s a fundraising cookbook published by the San Antonio Conservation Society of 1982. I adapted this recipe from one shared by Mrs. LeRoy C. Gass. Say the word “Texas” and images of Tex-Mex food, big steaks, smoked briskets and BBQ may come to mind. But, did you know that there’s a large German community in Texas? As a kid living near San Antonio, we attended many German festivals in the Fall and frequented our share of German restaurants. The food served was always hearty and full of flavor. Some of my favorite German menu items were those that were both sweet and sour like Saurbrauten and German potato salad. So, when I saw a sweet and sour green beans recipe in my cookbook, I knew I had to try it. I already have a recipe featuring green beans tossed in oil and vinegar, but this is the first green bean recipe with vinegar and sugar I have tried. (Of course, I used a sugar substitute.) The sweet and sour sauce is perfect with bacon and onions. Whole grain mustard punches up the flavor and adds another textural element to this dish. 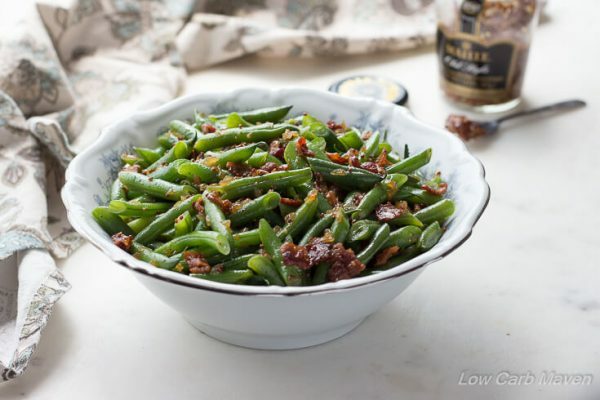 I can honestly say that this German green beans recipe is one of our favorites at the moment. 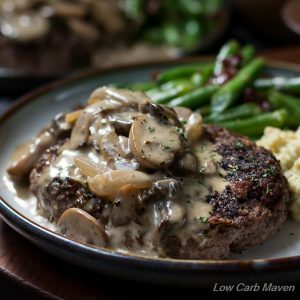 I served these delicious German green beans with fabulous hamburger steaks and they were a match made in heaven. 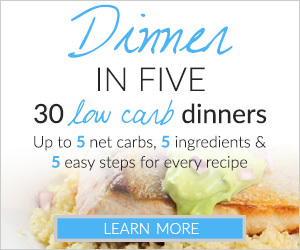 This great low carb side is perfect with any pork chop or chicken recipe, too. Sweet and Sour German Green Beans With Bacon are 4 net carbs per serving. 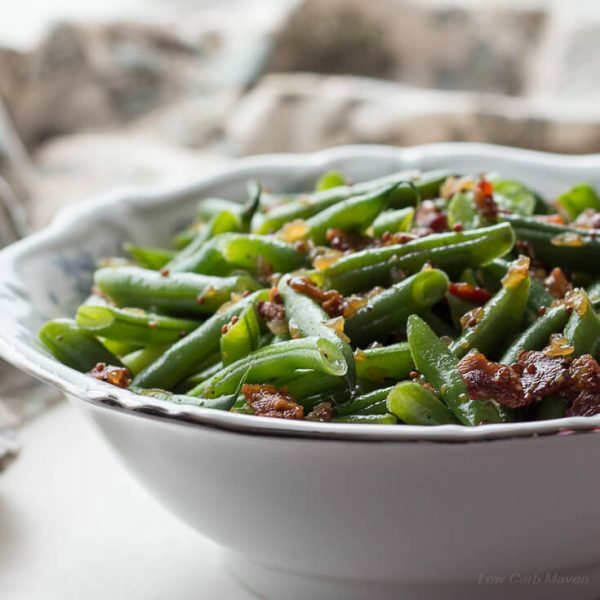 German green beans feature crisp-tender green beans warmed in a sweet and sour sauce with bacon, onions, cider vinegar and brown sugar. Healthy & delicious. Trim the beans. Chop the onions, and dice the bacon. Cook the green beans until tender. I steam mine in the microwave, but use your favorite method. Drain well once cooked. While the beans cook, put the bacon in a medium-large pan over medium heat. Let the bacon cook for 4 minutes until almost crispy. Add the onions and saute until they begin to soften. Add the cider vinegar, water and Sukrin Gold (or brown sugar if not low carb) to the bacon and onions and stir. Reduce slightly. Measure the whole grain mustard into the pan. Lastly, add the green beans and stir to coat and heat through. Season to taste with salt and pepper. I like lots of pepper because it brings out a nice savory flavor. Serve hot. 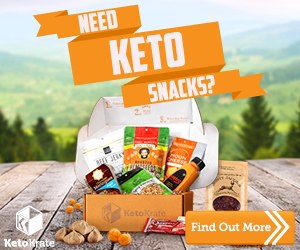 Can I substitute Sukrin Gold with erythitol? I don’t want to buy another sweetener right now. Thank you for this recipe. It’s funny…I actually didn’t search for “low carb German green beans” but I was making low carb chicken fried steak and was wanting Gristmill type of green beans to with. I’m a transplant from Texas to Tennessee, and a low carb er as well and miss trips to the Hill Country and Gristmill CFS with green beans. 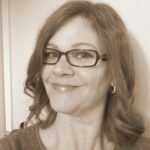 It was funny to me that you were blogging about the German influence in Texas. I figured, well this has got to be the one. Haven’t tried yet, but it smells great! The family loved these green beans. They were easy and tasted great. We left out the sweetener. Gave this a try tonight-happy to report that my husband and I scarfed it down and there are NO leftovers. A change from the usual plain old, same old for dinner and didn’t take much time. Looking forward to making it again-and again ! Made these green beans today. They are amazing and come together with ease. 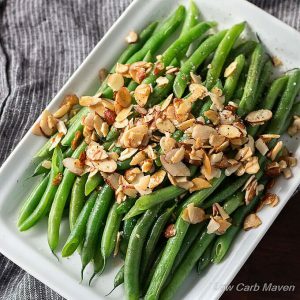 I had a lot of fresh organic green beans from my CSA to use, and so I was delighted to see this recipe posted on your Facebook page. I knew that I had to make it, which I did this evening to go with a pork roast. My family loved it! Even my vegetable-hating husband tried them and said they were really good. The only thing I will do differently next time is add a little more vinegar and mustard. That’s just my preference; the recipe is fantastic as is. 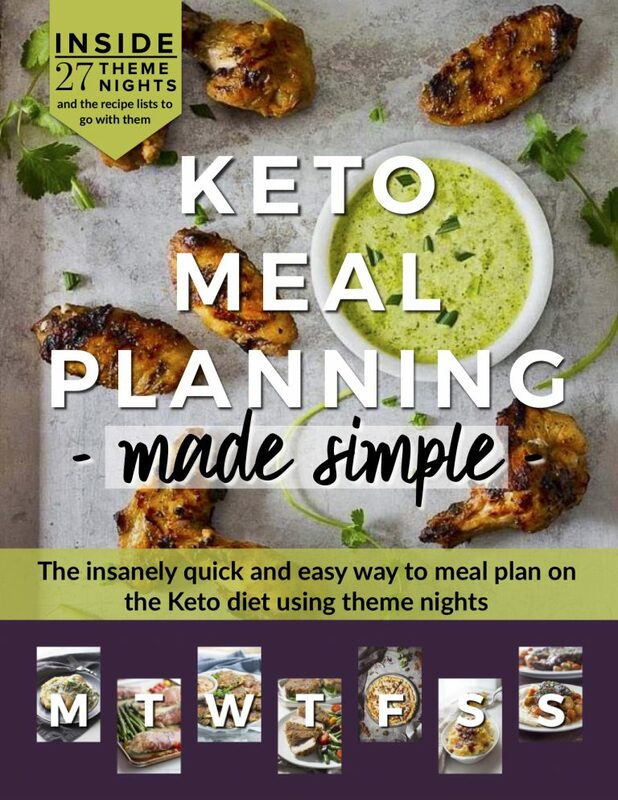 Thank you for all that you do to bring us delicious, healthy low-carb recipes and tips! Thanks for the recipe! Looks delicious! 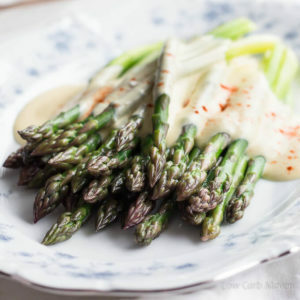 I would be interested in your thoughts on making this with canned green beans. What do you consider a serving on your recipes? I’m guessing vegetables are 1/2 cup? New Braunfels! Wurstfest!! LOL ~ Spent many a time there. Can’t wait to try these beans.